Tag Archive | "Club Gramercy"
Lately, my email system’s in-box has been filled with out-of-the-ordinary messages. Sadly, the last of these was from the grandson of a dear friend, informing me that his grandfather has passed on. Thus, I am moved to write this tribute to an extraordinary man who touched my life. My friend was baptized Nicholas J. Prestipino in 1923. Nicky, as he would come to be called, was raised in an ethnically mixed South Philadelphia neighborhood, in the vicinity of 10th and Ritner Streets: my neighborhood. Although he was three years older than I was during the Great Depression, we grew up together and even attended the same schools. It was during these years that he was nicknamed Nicky Blue, a moniker that would stick with him until he was laid to rest. En route to our manhood, something happened that would forever change our lives. When World War II erupted, it subjected men between the ages of 18 and 45 to the draft. Enlisted into the armed forces, many boys from our neighborhood were called to serve their country. Nicky was inducted into the Army and trained for the Infantry. His tour of duty would take him to the theater of war known as China, Burma, and India (CBI). By chance, two other neighborhood boys serving in an Ordinance company were sent to the same arena. Their names were Anthony Didio and James (Jimmy) Celotto. Because of the different branches of the service into which they were inducted, these three young men did not serve together. Anthony recalls that while stationed in China, he and Jimmy decided one day to visit a local airfield to watch planes arrive and depart for various destinations. As they watched a plane taxiing along the runway in order to refuel, they were surprised and delighted to see Nicky Blue among the men deplaning. For a brief period, all three had a joyous reunion. The story of the war in that region proved to have heavy American and Allied causalities; it had been a near impossible task to repel the occupying Japanese. So vivid and poignant were these stories that Hollywood made two movies about this arm of the war, naming the films Merrill’s Marauders, starring Jeff Chandler, and Objective Burma, with Errol Flynn in the lead role. Thankfully, Anthony and Jimmy had been wrong about Nicky Blue. His courage and smarts enabled him to survive what so many had not. When the atomic bombs were dropped on Japan, World War II came to an abrupt end. With its end came the return home of those soldiers who had endured this long conflict. As the boys returned one by one to our neighborhood, they gathered on the corner of 10th and Ritner Streets to re-forge the connection that the war had interrupted. From these informal meetings, Club Gramercy was born. This was a social club in which we spent many pleasant hours in pursuit of our past. As time passed, many of the boys — now men — married and drifted away to pursue family life. But in 1986, two members met across a meat counter in a Northeast Philadelphia supermarket and decided to bring the boys together again. These two friends were Baby Joe Carabasi and Tony Griffoni. Through networking, they accomplished the first meeting of 12 friends at the home of Amadea (John) Adelizzi in Palmyra, New Jersey, a conference of sorts for The Boys of 10th and Ritner. Within six months, our numbers had more than quadrupled. Fifty-four friends showed up at Vitale’s Restaurant in Northeast Philadelphia for the first official meeting of The Boys from 10th and Ritner. These meetings continued for more than ten years at Cobblestones Bar & Grill in South Philly. 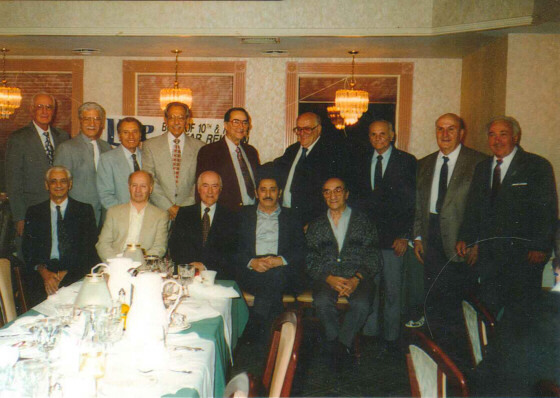 We celebrated our 10-year anniversary in 1996 at the Coastline Restaurant in Cherry Hill, New Jersey. Over meals and a little wine, we relived our youth, told war stories and jokes, and shared news of happenings that pertained to us. Today, our members have dwindled to but a few. Our ages and our accompanying ailments have put up roadblocks to our physical gatherings, but we do keep in touch by phone and email. When I received the news of Nicky’s death by email, I contacted Joe DeGenova and Anthony Didio to inform them, and to ask them to pass the information on to our other surviving members. Perhaps not surprisingly, both Joe and Anthony had the same response when hearing the news: “I can’t believe that Nicky Blue is gone!” Neither could I, because Nicky had always had that “larger than life” personality. My wife and I used to gather with special friends every July at the Golden Inn in Avalon, New Jersey. One year we were introduced to a new couple that spent the weekend with us. In conversation, they told us that they resided in Hammonton, New Jersey. This caused me to ask if they knew Nicky Blue Prestipino. With a broad smile on his face, the husband replied, “Everybody knows Nicky Blue!” Indeed, Nicky seemed to touch the lives of all whom he encountered. An unforgettable person, just saying that nickname, “Nicky Blue,” brings a smile to my face and the face of anyone who knew him. Nicky has become a legend amongst family and friends. Not just an ordinary person, he exhibited extraordinary courage fighting in the jungles of Burma during the war, and the memories of that war haunted him until the end. Perhaps that is why Nicky still retained his great zest for life. I know Nicky Blue lived his life by that motto. A beloved member of The Boys of 10th and Ritner, he will be greatly missed by the surviving members of our group. We offer the final salute in saying “Goodbye, Nicky Blue,” as we have to all of our members who preceded him into the Kingdom of Heaven.